Whether we’re in the mood to get an early start to the day, or the previous night’s activities have made that decision for us, we love living in Mumbai because there’s always a place to grab a bite at the crack of dawn. From South Indian goodies to freshly baked rolls, here are our favourite Mumbai restaurants to hit up before the sun comes up. A small place tucked away in a Malad lane, Sunday Treat is a vegetarian canteen with an outdoor setting that can hold up to 30-40 people. It opens its doors at 5am, after which you can grab anything off their menu. We loved the open cheese dosa and the Kerala masala dosa. This joint only takes cash, but don’t worry. The next-door ATM was our saviour. The outdoor seating with its plastic seating is a little lacklustre, so we opted to sit in our taxi while chomping down. As the monsoons approach, we think we’ll be bookmarking this place more as a pick-up joint. Price: Open cheese dosa INR 100, Kerala masala dosa INR 100, sandwiches INR 30 upwards. This one in Powai is meant for the IIT-B crowd next door, but that didn’t stop us from hitting it up at 4.30am last week. This place is a little hard to find, so we had to stop and ask for directions a couple of times. Check out the onion and egg dosa, medu vada, dal vada and filter coffee. 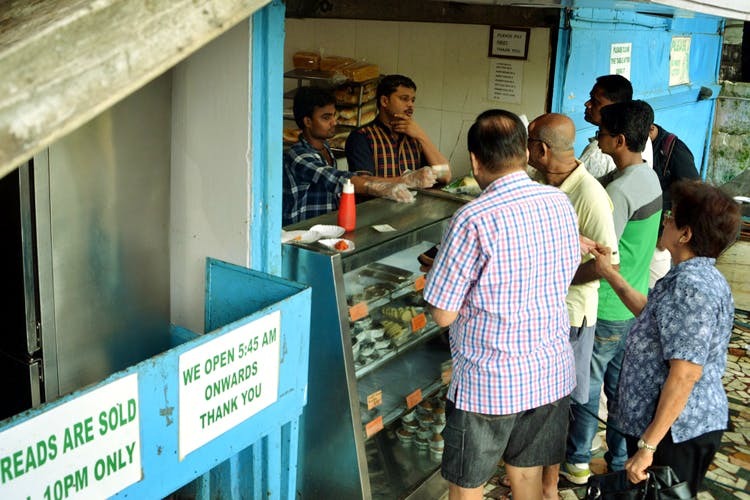 This purely breakfast joint serves up only South Indian. We weren’t fans of the strong smells emanating from neighbouring streets, and the wobbly chairs and tables didn’t make for the best comfortable experience. Hit it up for your quick fixes, not for a relaxed breakfast. Opening at 5am, the crowds lining up outside Hotel Ramashray at dawn are a testament to its popularity. We had to wait around 20 minutes for a table, but it was worth it. Only certain food items are available early in the morning. We recommend the popular dishes like ghee dosa, idlis, upma, and filter coffee. Do not forget to try their pineapple or mango sheera, it’s a part of the Ramashray experience. With no printed menu, the dishes are written on a wall, along with the day’s special. We quite liked their concept of sharing tables, though it may not be the ideal situation for when privacy is needed. Amidst the chaos, the waiters have a systematic way of running things, so we got our food within minutes. A1 Bakery opens slightly later than the others on this list, at 5.45am, but it’s still worth a stop. It’s visited by local aunties stocking up on loaves of bread, as well as runners looking for a post-workout carb load. We loved A1 Bakery for its delicious chicken kathi rolls, chicken puffs, cutlets, and a varied range of croissants. The place does not offer seating but that doesn’t stop people from standing near-by and gorging on the rolls. Be wary, parking is an issue. Open at 5am, Shree Muthappan is another place we ended up waiting for a table for around 20 minutes, but it was worth it. Though the menu offers vegetarian and non-vegetarian dishes alike, they only serve appam and coffee for breakfast-goers till 11am. We loved it – appams are, after all, their signature dish. With very little room for parking outside and the waiting time, we’re planning on reaching slightly earlier next time, at say 4.45am. Another hidden gem of Mumbai, we discovered Iran like Restaurant open near the JJ School of Arts at 5am. It’s easy to miss, so keep an eye out near the school. A menu full of non-vegetarian and vegetarian dishes, the food isn’t really authentic Iranian food. However, the meat here is halal. In the mornings they only serve certain items, so make sure to try their classic keema pav and anda bhurjee. The decor is basic, with metal tables and chairs set up in a dhaba-like set-up. The walls have helpful photos of some of their dishes, as well as accompanying Coke advertisements. We discovered Welcome Restaurant on our way to Goa. Easily accessible off the Mumbai-Goa highway before Panvel, this is our favourite stop on the way to weekend destinations along the coastline. The menu items are a little over-priced for what is a very basic menu, they do offer some decent Mughlai and Chinese cuisine. For breakfast, try their keema pav, egg bhurjee pav, omelette and bun maska, with a choice of tea or coffee. Welcome Restaurant is a highway dhaba, so we were ready for the plastic chairs, food market ambience and milling families.